On April 8th, 2014, Marine and Army veteran, J.A. Harris will begin a solo thru-hike of the Appalachian Trail to raise money and awareness for Semper Fi Fund; a non-profit organization that provides support and assistance for wounded and ill service members and their families. 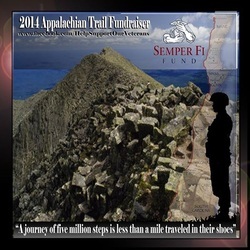 100% of the donations raised goes directly to Semper Fi Fund. If you were to donate ten cents per mile the total would be $218, five cents would be $109, and if you were to pledge just a penny per mile the total donated would cost you less than two tickets to see a 3-D movie. The men and women of our armed forces Volunteer to defend our freedom and it is our responsibility to give all the help that we can. Please help me and the Semper Fi Fund help them. I will complete the entire length of the Appalachian Trail, which runs through 14 States, starting in Georgia and ending in Maine, by August 15th, 2014. Its said that the 2185.3 mile hike takes approximately five million steps to complete. Using my military background combined with your generosity we can come together to for those who deserve our respect and need our help. Let each step increase the amount we can provide to those who need it most. 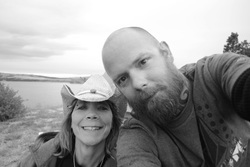 I will also be writing a book about the entire experience with all royalties being donated to Semper Fi Fund. 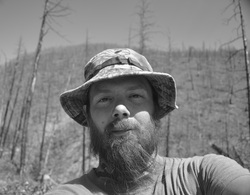 Follow Harris' progress along the AT as he blogs and posts pictures while hiking to raise money for those in need through this website and for Veterans Journal. Thank you for your patience and support but most importantly for believing in me when I had a hard time believing in myself. You are my best friend and your love has truly changed my life. You saw through the rough exterior of an addict and alcoholic then hung on when most would have let go. You are the source of my inspiration for living a sober life. I could never thank you enough for opening my eyes to a world filled with accomplished goals, personal success, and unconditional love. Even though the hike along the AT is going to be one-way this is a round-trip journey and I'll be home as soon as I can. Just remember that each step I take brings me closer to being back where I belong...with you in my arms. I love you.